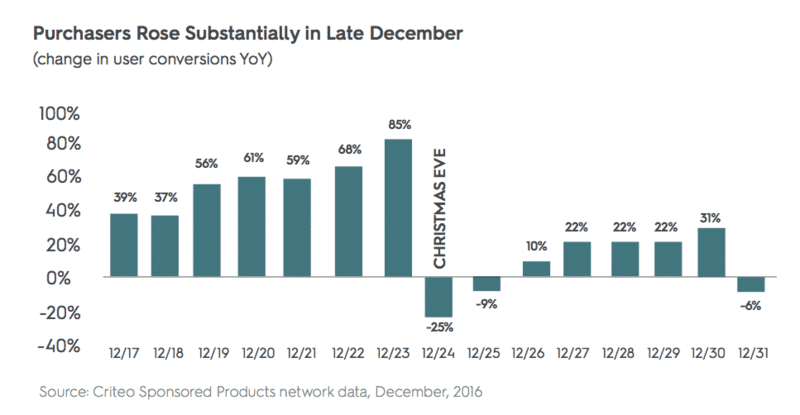 For marketers looking to move more of their year-end inventory, the week between Christmas and New Year’s is the time to do it. According to Criteo shopper data, many shoppers are breaking out the gift cards they received over the holidays to do some year-end shopping for themselves. And that’s the start of Cyber Week II. Right after Christmas and before New Year’s, shoppers seem to be particularly interested in buying consumer electronics. Criteo data shows a noticeable spike in consumer electronics sales after the holidays. Shoppers are comparing prices in November and finally clicking “buy” after Christmas, when CE products go further on sale. Criteo shopper data also shows that 54% of CE purchases after Christmas are made on impulse, meaning shoppers are open to buying goods not on their lists. Marketers are gearing up to debut new products at the Consumer Electronics Show in Las Vegas (come visit us there!) which means discounting older models to make room for new inventory. Shoppers, finished with their shopping for others, are perhaps shopping for themselves and getting some big ticket electronics like laptops and TVs for end-of-year tax write-offs. The holiday season is a “golden quarter” for ecommerce. It begins well before Halloween and stretches past the New Year. With the emergence of new leading ecommerce days like Black Thursday and Cyber Week 2, it’s clear that “traditional” ecommerce holidays are evolving beyond their old timelines. That’s why it’s important for brands and retailers to build out commerce marketing strategies that extend the lifecycle of holiday campaigns. By optimizing dynamic retargeting ads and sponsored product campaigns, it’s easy to generate conversions across the Golden Quarter purchase cycle.